Here's Tom with the weather...: Goodbye, Sir Alexander Chapman Ferguson. Thank you. Goodbye, Sir Alexander Chapman Ferguson. Thank you. 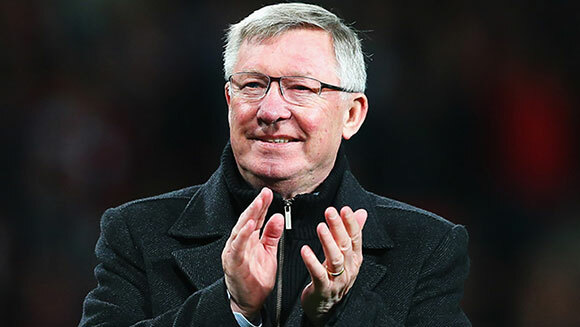 For me, Manchester United and Sir Alex Ferguson are one and the same. The Scot was at the helm when, at the age of eleven, I completed my collection of Pro Set collector cards featuring the likes of Clayton Blackmore and Mal Donaghy and announced myself as a fully-fledged fan. As Sky’s pumped-up Premier League allowed armchair football fanatics their greatest ever access to the game, my support for the club became an obsession. I distinctly remember watching a match with my dad and asking him why Bryan Robson was wearing an armband. “He’s the captain,” my old man responded – the first in a long line of inspirational figures deputised as Fergie’s leader on the pitch: Bruce, Cantona, Keane, Neville and Vidic. This collection of snarling warriors emblemise everything Ferguson stands for: heart, spirit, courage and a never-say-die attitude which has rescued so many late goals for a club which refuses to admit defeat – the qualities which, allied with no little skill, have seen Manchester United dominate English football for more than twenty years. Stamping his personality so clearly on his club has led to Ferguson being despised by many, and his run-ins with Kevin Keegan, Arsene Wenger and Rafa Benitez have been edged with a spitefulness which has occasionally gone too far. But this siege mentality was identified today, by fellow retiree Paul Scholes, as Fergie’s greatest strength. Who are we to argue with that? Those who know him best, of course, point to an altogether different kind of character. Always available to offer advice to fellow managers, father figure to the likes of Cristiano Ronaldo and Ryan Giggs, devoted family man and, as the years have rolled by, an increasingly endearing character dancing his strange half-jig in the dugout. My love and admiration for the man is intrinsically tied to my love for the club. I’ve never known one without the other. So many wonderful memories are tied to the club: obvious highlights like the Camp Nou comeback in 1999, Fergie and Brian Kidd leaping around as Steve Bruce headed two title-winning goals in 1993, Yorke and Cole combining beautifully against Barcelona. But it’s not just those glory nights which make Sir Alex Ferguson’s teams special. Rather, it’s that sense of comfort and security he offered. While other clubs chop and change, fight and fuss, Manchester United simply evolve. Wholesale tinkering is not the Ferguson way. Instead, he seamlessly integrated new players into his sides, marrying young local talent with experienced old timers, fancy foreigners with wise European campaigners. He built at least three great sides in this way: the powerhouses of Keane, Ince, Schmeichel and Hughes; the treble winning buccaneers; the 2008 vintage of Ronaldo and Rooney. I can offer little more tribute than those which have already been paid. His emotional interview with his old pal Geoff Shreeves (“Well done, Geoff”) was a beautiful tribute to his patient wife Cathy, and yet another signifier of his strength of character: the decision was made at Christmas but was kept completely secret so as not to distract from the club’s title tilt. He will remain at Old Trafford forever: cast in bronze, the stand bearing his name, his presence in the directors’ box. But more importantly he will remain in the supporters’ hearts, woven into the fabric of the great club he built, his name sung forever more on the Stretford End and his legacy enduring long after he is gone. Schmeichel, Neville, Ferdinand, Vidic, Irwin, Ronaldo, Keane, Scholes, Giggs, Hughes, Cole.